NAIROBI, Kenya (RNS) -- The escalating slaughter of elephants and rhinos is drawing the anger of conservationist clerics, who have begun enlisting church members in the battle to save Africa’s wildlife. The clerics are driven by a view that these animals are God’s gifts to nature and a critical part of Africa’s heritage. Christian and Muslim religious leaders are sounding the alarm about slaughter of elephants and rhinos in Africa to feed demand for illegal ivory in Asia. In Kenya, their concerns heightened in mid-March after the conservation group Wildlife Direct said 16 rhinos had been gunned down in the first three months of the year. More than 30 elephants have also been slaughtered since January. Odira said priests and lay leaders in wildlife zones were dedicating time each Sunday and during evangelization gatherings to educate communities on the value of wildlife. “We are targeting attitude change because the poachers pass through the communities’ lands when targeting the animals. We want to change an existing view that animals are dangerous and need to be fought,” he said. International cartels kill the animals to feed a growing illegal ivory market in Asian countries, according to the Kenya Wildlife Service. In Asia, rhino horn powder is wrongly believed to cure cancer and to be an aphrodisiac. A kilogram of ivory is worth approximately $1,500 on the black market, while a rhino horn can fetch $65,000 to $100,000 a kilogram. This is about 2.5 times the value of gold. Two years ago, National Geographic reported that the ivory was carved into baby Jesus and Catholic saint figurines, Muslim prayer beads, Coptic crosses, amulets for Buddhists and elaborate Buddhist and Taoist carvings. Rev. Patrick Maina, a Presbyterian pastor in the Rift Valley of Kenya, which hosts many private wildlife ranches, is also carrying out educational efforts centered on related conservation issues. “I am engaging pastors’ fellowship on the dangers of charcoal burning. 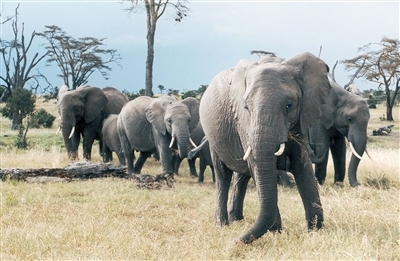 It is destroying local habitat for the wildlife,” Maina said. Through his efforts, some youths are also manning electric fences in the reserves. African religious leaders have reached out to Asian religious groups to raise awareness about where their ivory comes from and the toll that poaching takes on African wildlife. But for Imam Idi Kasozi, Ugandan Muslim conservationist, corruption and poverty are escalating poaching in Africa. Copyright 2014 Religion News Service. All rights reserved. No part of this transmission may be reproduced without written permission.